Dental bonding by the dentist at Woodbury Dental and Laser Clinic is a procedure used in dentistry to address a number of dental problems concerning the improvement of the teeth’s form and function. The bonding process makes use of a tooth-coloured hard plastic material, which is affixed or bonded to the affected tooth, to improve both its appearance and its function. The result is a significantly-improved tooth that looks very natural. The customised dental bonding procedure by tne dentist can be done and finished in a single dental appointment (depending on the number of teeth involved), providing you with a vastly-improved smile without the long wait for more complicated procedures to be finished. Prior to the actual bonding of the tooth-coloured material to the affected tooth, the dentist at Woodbury Dental and Laser Clinic will determine the correct shade (of the dental bonding material) to match the existing natural teeth. An anaesthetic is not usually needed, except for cases when the bonding is used to fill a cavity caused by tooth decay. The surface of the tooth to be treated with dental bonding will need to be prepared, to ensure that the bonding material will adhere to it successfully. The tooth-coloured bonding material will then by applied to the affected tooth by the dentist at Woodbury Dental and Laser Clinic Kent and the necessary moulding and smoothening will be done to achieve the desired look, and to make the treated tooth blend in seamlessly with the appearance of the rest of the other teeth. Laser light will then be used to harden the bonding material, ensuring that it also bonds successfully with the tooth. After making sure that the bonding material has been given enough time to harden and bond completely with the tooth, the dentist at Woodbury Dental and Laser Clinic will then proceed to further shaping and trimming of the tooth-coloured material to further improve the appearance of the treated tooth. Polishing can also be done to make the tooth look more natural, and to ensure that it looks exactly the same as the other natural teeth. Depending on the severity of the tooth damage, the dental bonding procedure can be finished in about 30 to 60 minutes, for each affected tooth. 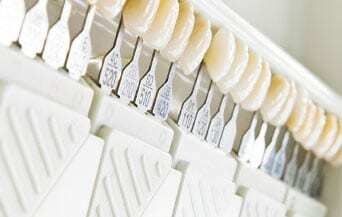 What Conditions can be improved by Dental Bonding? The conditions or dental problems given below can be addressed by dental bonding by the dentist at Woodbury Dental and Laser Clinic. Decayed Teeth – Even a single decayed tooth can vastly affect the appearance of a person’s smile, and it has a tendency to develop into more serious dental problems if not addressed soon enough. The form and function of decayed teeth can be improved with a dental bonding treatment. After all the tooth’s decayed portions have successfully been removed, the tooth-coloured material is then used to cover the tooth, resulting in a much-improved appearance. Cracked or Chipped Teeth – Cracks and chips on the teeth can negatively affect the smile’s appearance, and can also be the start of more serious dental problems; these small damaged parts of the teeth can get bigger, opening more opportunities for infections and tooth decay to set in. Chips and cracks on teeth can be repaired with dental bonding, which can also prevent further damage from developing on the affected tooth. Stained or Discoloured Teeth – Stains or discolourations can adversely affect the appearance of a person’s smile. Teeth whitening can be done to remove the unsightly stains; however, when whitening procedures are not enough to remove stubborn stains and discolourations, dental bonding is the best option. Dental bonding by the dentist at Woodbury Dental and Laser Clinic can be done to effectively cover the unsightly part of the tooth, so that it looks healthy once more. Irregularly-Shaped Teeth – Teeth that have irregular shapes can have a negative impact on the appearance of a person’s smile; the irregularities in teeth shapes can also pose difficulties in cleaning, and may also cause uncomfortable friction against the gums and the soft tissues inside the mouth (or other parts that come into contact with the irregularly-shaped tooth). Bonding by a Kent dentist can effectively address irregularly-shaped teeth, improving the teeth’s form and function – and the person’s overall dental health. Spaces Between Teeth – Unsightly spaces between the teeth can be quickly remedied with dental bonding. Bigger gaps or spaces can be addressed with orthodontics; however, for minor spaces between teeth – dental bonding is the best option. The tooth-coloured material is molded to fit into the spaces between teeth, so the smile looks more “complete” and more attractive. We at Woodbury Dental and Laser Clinic can use bonding to change tooth color, shape, and size, or to repair fractured teeth. We can also use bonding to give the appearance of straight teeth. However, we caution our patients to avoid hard foods, as this may cause the bonded restoration to chip or fracture. A bonded restoration can be polished to look the same as your natural teeth and may also stain in a similar manner as your own teeth. Stains are removed during the patient’s regular cleaning appointments by polishing these restorations.